Wow! 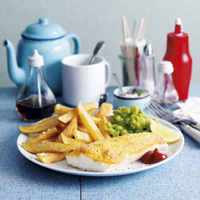 Oven baked fish and chips with a clever flour free coating for the fish with a lovely light texture. 1 Preheat the oven to 200°C, Gas 6. Boil the chips in lightly salted boiling water for 5 minutes. Drain well, return to the pan and cover. Leave to cool slightly then shake the pan to roughen the edges. 2 Line a baking tray with non-stick baking parchment and arrange the chips in a single layer. Spray with low calorie cooking spray and bake for 20 minutes or until golden. 4 Whisk the egg whites in a large bowl until they form soft peaks. Whisk the yolks in another bowl and fold into the egg whites along with a pinch of salt. Stir to mix well and spoon the mixture over the fish.